A crawler dozer, commonly referred to as a bulldozer, is a heavy equipment vehicle used in a wide range of projects. It is commonly used for: Road Building, Mining, Land Clearing, Forestry, Construction and Military. Crawler dozers are large, powerful equipment that provides mobile, stable, earth-moving abilities. 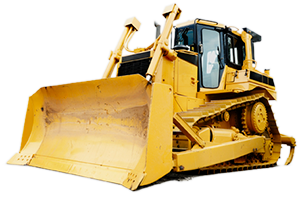 There are several types of crawler dozers including the bulldozer, calfdozer, and the angledozer. The large machines are typically used for new roadways and mining while the smaller machines are used for grading. Crawler dozers are tractors that are propelled using continuous tracks that distribute the weight of the machine and provide stability on rough terrain. The primary tools of the crawler dozer are the blade and the ripper. The blade is a heavy plate made of metal that has a variety of uses. It pushes objects such as rock and debris, can be used for grading, and can carry large materials. There are three types of blades that perform these tasks: S blade, U blade, and semi-U blade. Additionally, the blade may be attached using tile cylinders for angling the blade and can be sharpened to cut objects. The ripper is typically on the back of the crawler dozer and is a long claw-like tool. Rippers are primarily used for breaking up rocky earth, surface rock, or pavement. Rippers are available as single shank or multi-shank with the former preferred for heavy ripping. Furthermore, the ripper can come with an attachment used to split tree stumps called the stumpbuster. Four-way blades move up, down and can be angled left, and right. This allows the operator to push debris, snow, and dirt to one side and can provide clearance on tight job sites. Six-way blades have the same range of motion as four-way blades, but they also allow for the blade to be tilted up and down. The blade can angle up on one side and down on the other which is helpful for grading and road leveling. There are several popular manufacturers in the backhoe market including John Deere, Caterpillar, CASE, and Komatsu.